Sunshine is a precious commodity. There’s less of it every day this time of year. The pump for the aquaponics runs on batteries. They’re charged with solar panels. The panels aren’t getting much sun what with shorter days that are often foggy or cloudy. I want something else to supplement our current power solution. I’ve decided to try out wind. Actually, way back when we first bought the property, I bought an anemometer to measure wind speed. Things looked pretty good 20 feet off the ground. I have never built a wind turbine. I decided to build a model before investing a lot into this project. I decided I wanted a DC motor. This would save a lot of tinkering. I should be able to spin it and get juice. I paid $100 for this e300 razor. A Craigslist special. It’s a 24 volt scooter. There was absolutely nothing wrong with it. So, I took it apart. There were a couple 12 volt, 7 amp hour batteries inside. The motor below is 250 watts. I can’t say enough good things about this scooter. Razor builds a good product. The wiring was quality along with the motor, batteries and even the frame was overbuilt. I decided I could use the chassis as part of the initial build. Here’s an amazing illustration that shows the plan. What is there to say after a picture like that? This wind turbine is a vertical access wind turbine (VAWT). 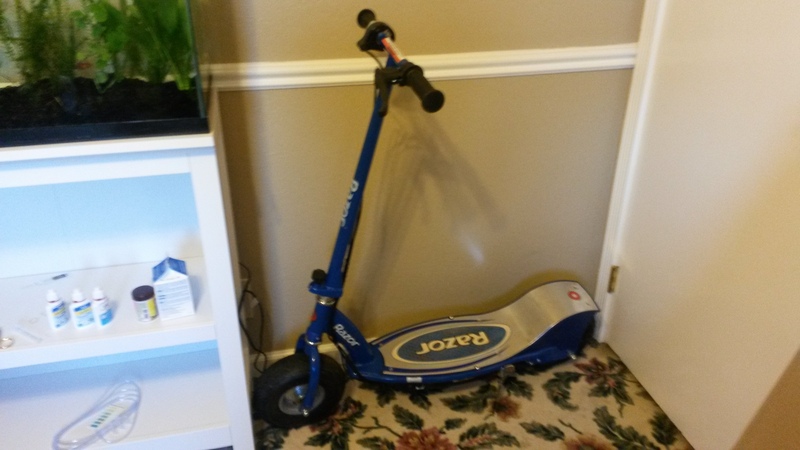 The plan is to remove the handle bars on the scooter and replace them with wind blades. 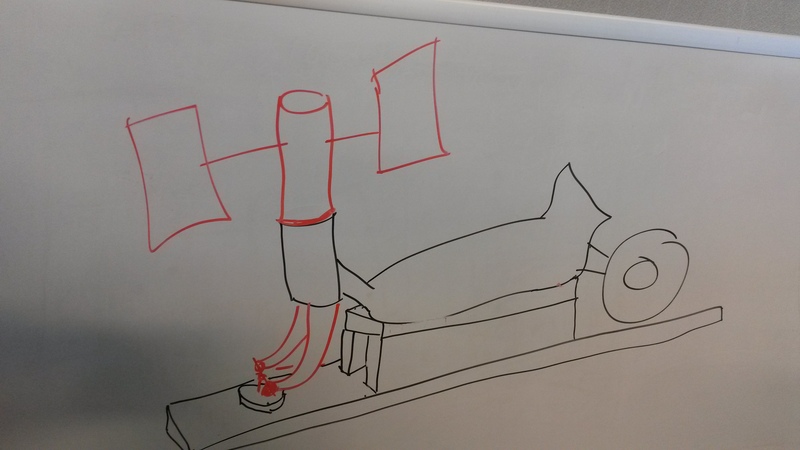 The motor will go between the forks, which will spin the motor’s shaft. Voila! Here’s a video of the result. My apologies–I managed to lose the amp measurements. They were low, in the .1 range. The voltage ran as high as .33, that was before the camera started running. Did you notice that the blades are on hinges? You might try googling “Sharpe Cycloturbine”. Honestly, it took me a while to start recording. I was stunned that my first effort worked. The next step is to improve the materials and build quality of the rotor and blades. Eventually I’ll go to a 1/2 motor as well. Feel free to bug me if you have questions. 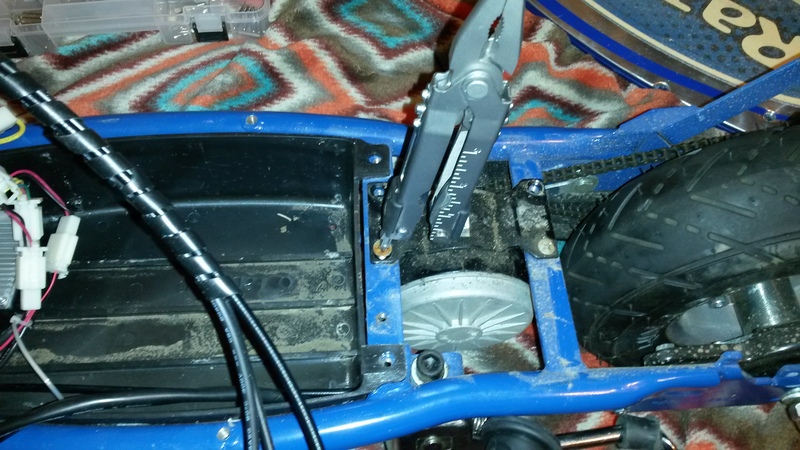 This entry was posted in Tools and Equipment, Uncategorized and tagged electric scooter, sharpe cycloturbine, wind turbine by admin. Bookmark the permalink. Looks awesome!!! 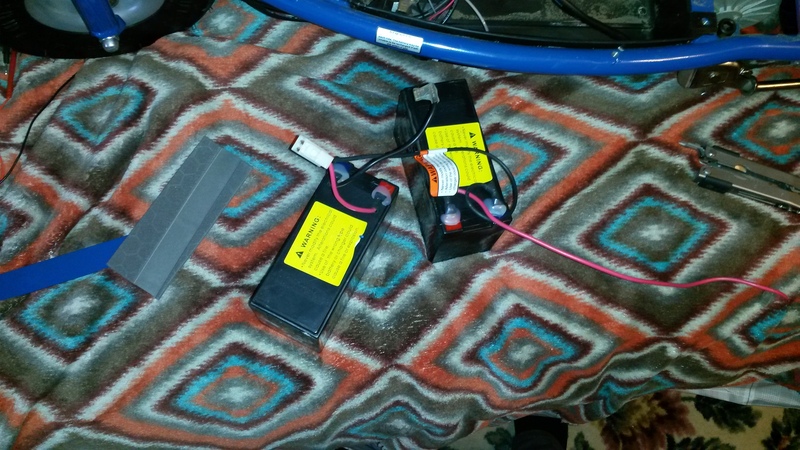 So you going to run to (2) 12v batteries and break it down to 12v then? It will go to my 12 volt battery bank when completed. I’ll need to build a better rotor and vanes first.